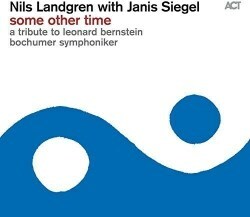 Celebrated trombonist Nils Landgren and his Quartet team up with The Manhattan Transfer’s Janis Siegel and members of the Bochumer Symphoniker to present this self-titled tribute to Leonard Bernstein. Homage is certainly paid to LB’s melodic invention, but what is said of his abundant passion and creative energy? Jazz/orchestral fusions can go in many directions, and this one is decidedly cool, leisurely almost. Relaxed tempo and temperature at times push the music perilously close to easy listening – even muzak. That, one imagines, would not please Lenny at all. Themes from West Side Story make up half the programme. The opening overture on America is not the implied rampage, but a gentle, Copland-esque brass chorale. A nice touch. The full ensemble follow with the title track, Some Other Time from On the Town, and this largely sets the mood and tenor for the rest. The vocal contributions of Siegel and Landgren are just adequate, the latter’s croon-in-your-ear style best taken in small doses. Better vocals might have lifted the whole production, but as it is, the laid-back becomes the languid, and monotony infects the mood. Landgren’s masterful trombone features throughout, in mostly mellifluous vein. The two West Side Story love songs, played as instrumental solos, provide an interesting contrast. Maria is about as animated as things get, with its underlying ecstasy informing Landgren’s up-tempo part. Played straighter, however, One Hand, One Heart – Tony and Maria’s impassioned duet – is reduced to a kind of flatulent sentimentality. In its own right, I can imagine this CD having many fans; admirers of Nils Landgren, Janis Siegel (as a soloist), and the others involved. It is very decently recorded, competently played, and features some novel arrangements of the thematic material; as mentioned previously, the opening track is a personal highlight. There is a ready market for this kind of jazz fusion. With the right ingredients it can work superbly and, indeed, catch fire. Bernstein in his own work demonstrated as much. To me, however, Landgren’s pleasant, thoughtful but ultimately uninspiring approach doesn’t make the cut, and may very quickly be relegated to dinner party duty. As a declared tribute to one of the twentieth century's greatest composers and performers, would this be good enough?